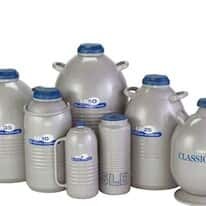 Cryogenic storage dewars are specialized vacuum flasks that hold liquid nitrogen or liquid helium (cryogens). Choosing the right dewar that best suits your application is critical. A liquid nitrogen dewar should have the shape, capacity, and material construction to store your sample. Look for dewars that feature high performance construction and advanced insulation materials to ensure high thermal efficiency. Nitrogen dewars should have low heat conductivity and a high vacuum. Also consider your need for easy-grip handles to move the liquid nitrogen containers.